Madsonic Mashup Mod is a fork of the Subsonic 4.7 Server Build 3090 with some Subsonic Data schema modifications! 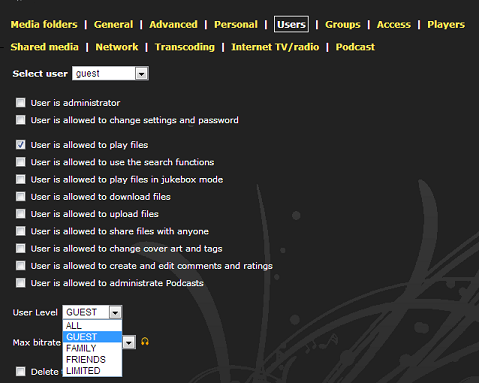 I think one of the most often requested features is access control to the Media Folders on a per user basis. I'd be willing to make another donation to see this happen. Yeah, I'm not too particular about how sophisticated a setup anyone comes up with, but at the very least I would think that it would be pretty simple to designate a folder as public or private and then allow a user to access either or both. That would be enough for me, but I'm sure others will dream up all manner of sophistication so that Aunt Minnie can only access folders 2,4,& 7 but Uncle Earl can only get to 1,3&5 except if it's Thursday and it rains ... I'm still struggling with the folder vs. tags and dates vs, titles thing. Keeping it simple would be just fine by me, but so far we still got nuttin. I'm hoping one of the modders picks up on this idea - I'll do a donation to whoever implements it. Access rights with groups could be a solution and should cover every scenario. I'm working hard on this new feature for some time, many code need to be changed. U R da MAN !!! This might not be a "feature" per say and maybe this is already somewhat possible, I'm not sure - Is there a way to get Madsonic or even subsonic in general to read files in a cloud drive? I have a Bitcasa account ( http://l.bitcasa.com/Zu4KDDUy ) and would like to be able to scan the folder I have set up as an archive. 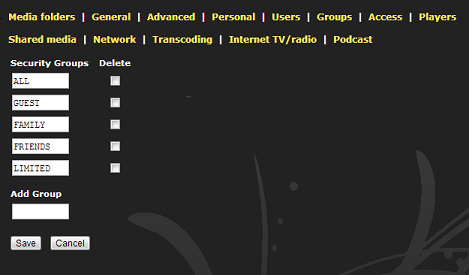 I use Plex as well, and it is able to scan my archived movie folder - but neither subsonic or madsonic is able to find any files... so, my request would be to be able to find a linked cloud drive which essentially works the same as a networked drive. Is this somehow possible or is my head too much in the cloud? Btw, Madsonic is a killer mod... thanks Madevil for all of your work on it - simply incredible. MadEvil wrote: Access rights with groups could be a solution and should cover every scenario. I would appreciate if you include options for menue-items to see or not to see. can't wait to see this new feature. Any workaround with subtitle, Madsonic? azkreationz wrote: This might not be a "feature" per say and maybe this is already somewhat possible, I'm not sure - Is there a way to get Madsonic or even subsonic in general to read files in a cloud drive? I have a Bitcasa account ( http://l.bitcasa.com/Zu4KDDUy ) and would like to be able to scan the folder I have set up as an archive. I use Plex as well, and it is able to scan my archived movie folder - but neither subsonic or madsonic is able to find any files... so, my request would be to be able to find a linked cloud drive which essentially works the same as a networked drive. PS - if you made this work, I would definitely donate a good amount!! When will this be completed? I am eager to see this implemented! If you have Bitcasa set up with an actual drive letter (for me it's I: ), then you can just point Madsonic or Subsonic to that folder. Not sure of your setup, but my setup is on a Linux machine running Madsonic, with all of my media on my Windows machine. Linux mounts the Windows "media" folder through /etc/fstab, and then I use that path as the media folder in Madsonic. If you have a similar setup, just share your Bitcasa drive letter on your Windows machine, then mount it under Linux, and use that path in Madsonic/Subsonic.